PMBComments: On the State of Venezuela's Democracy: Sept 26/05 – Unmasking a purely capitalist ploy: Hugo Chavez’s purchases support in the region the old fashion way – cash! Sept 26/05 – Unmasking a purely capitalist ploy: Hugo Chavez’s purchases support in the region the old fashion way – cash! One happy client being taken for a ride. PMBComment: Jackson Diehl, editorialist for the Washington Post, has distinguished himself over the years for his pristine perspective of what is being scorched in Caracas by the so called “Bolivarian revolution”. In his Op-Ed today, he unmasks Chávez’s colleagues in the region who are either too frightened to go public with their real views of the danger posed by the former democrat who has accelerated his power (and land) grab in Venezuela, or are lining up - hands stretched out - begging for support from this inexhaustible, and somewhat vindictive, patron. There is a story making the rounds in the region that the Argentine Foreign Ministry has formally ordered its diplomats around the world to refrain from making ANY comment that might be construed as critical of Mr. Chávez or his kleptocracy. The reason given by Foreign Minister Bielsa, is not ideological compatibility with the Bolivarian revolution, but a no-nonsense one: the Argentine state is bankrupt, we have no access to the capital markets and we need to continue milking Venezuela…therefore please keep your personal opinions to yourself till further notice…. But what is Venezuela getting out of this bigheartedness? As a country cero, but Hugo Chávez seems to be getting the kind of instant gratification a client gets from forking out money to a whore. Last week, he got a loud round of applause at the UN General Assembly, but then he did not get support from any country (Cuba never counts) in his bid to boycott the signing of the Assembly’s consensus document which he blasted as “fraudulent”. On the election for a new IADB President, Venezuela’s own candidate barely marshaled Venezuela’s vote. The “ungrateful” nations of the Caribbean all voted for the winner, Luis Alberto Moreno, strongly backed by Chavez archenemies Uribe and Bush. Thanks to the United Nations General Assembly, the presidents of three big South American countries visited the United States simultaneously this month. Two are close U.S. allies who, through the diligent pursuit of free-market policies, have overseen impressive economic growth and a reduction of poverty in their nations. The other is a self-declared enemy of Washington who, despite enjoying an extraordinary bonanza of oil revenue, has managed to increase the poor population in his country by a quarter. Chances are you heard about only one of these guys. Hugo Chavez, the "revolutionary" president of Venezuela, cut a flamboyant swath through New York, touring Harlem and the Bronx, chatting with Ted Koppel, basking in the applause of the General Assembly for his hyperbolic denunciations of American "imperialism" and capitalism. By contrast, Alvaro Uribe of Colombia and Alejandro Toledo of Peru passed through New York and Washington with barely a ripple. Not only that, they didn't really want to be noticed. True, both agreed to meet with editors and reporters of The Post. But neither one was willing to speak publicly about the biggest development in Latin America in years. That is, of course, the increasingly conspicuous emergence of Chavez as the political and ideological successor to Fidel Castro, and his aggressive attempt to succeed where Castro failed in constructing an anti-American alliance. It's not that Uribe and Toledo, like the left-wing leaders of Brazil and Argentina, secretly sympathize with Chavez: They don't. Toledo, once a victim of Alberto Fujimori's Peruvian dictatorship-in-the-shape-of-democracy, can hardly admire Chavez's similar destruction of Venezuela's political freedom. Uribe fights a leftist guerrilla movement created with Castro's help decades ago and now backed by Chavez, who granted asylum and even citizenship to one of its top leaders. Still, Uribe refused to say anything for publication about Chavez. Toledo doggedly limited himself to the new formula of the Organization of American States: "It's not enough to be elected democratically; it's also indispensable to govern democratically." He also let slip: "If I had as much money from oil as President Chavez, the story would be different." What's striking about all this is not Chavez's New York antics -- which were copied almost exactly from U.N. appearances by Castro -- but the silence and seeming demoralization of those Latin leaders who have stuck with the "Washington consensus" of free markets and democratic politics. By any reasonable measure, both Uribe and Toledo have succeeded: Their economies are growing rapidly, exports and foreign investment are way up, and extreme poverty is down. In Peru and Colombia, the number of people living on less than $2 a day under Toledo and Uribe stands at 54 and 52 percent, respectively. In Chavez's Venezuela, the rate has risen from 43 percent in 1999, the year he took office, to 53 percent last year, according to government statistics. During this same period Venezuelan oil revenue, which makes up most of the government's income, roughly doubled. 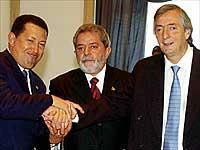 Yet Chavez's claim to be the champion of Latin America's dispossessed goes unchallenged by his peers. How could this be? Partly, of course, Chavez successfully mines the populism and anti-Americanism that is a perpetual undercurrent in Latin American politics and that is largely blind to results. He's a better politician than the sober, stern Uribe, and certainly more so than Toledo, whose chronically unpresidential (if harmless) behavior has given him the lowest popularity rating of any Latin leader. But Toledo's muttered aside also points to a critical difference: Chavez is literally buying the support of his neighbors. With each uptick in oil prices, his giveaways -- once limited to Cuba -- increase. He provides subsidized oil for 13 Caribbean countries and promises Brazil a new refinery; he bought $538 million of Argentina's crushing foreign debt. He filled in for Ecuador, a fellow oil producer, when it was unable to export for a few days. A samba school in Rio de Janeiro won his patronage. In short, anyone in Latin America seeking a handout these days looks to Caracas. That's why when Uribe and Toledo did speak about Venezuela, to their contacts in Congress and the Bush administration, the message was a simple one: Stop talking about Chavez, and start competing with him. Chavez-bashing, whether by Pat Robertson or Donald Rumsfeld, only sends his poll numbers soaring; meanwhile, say the Latin presidents, hard-pressed leaders are wondering if Washington has anything that matches Chavez's largesse. The opportunities to compete are readily available. There is, for example, an Andean free-trade agreement with the United States that the two presidents would like to wrap up by the end of October. Their pitch would be more convincing if they were willing to stand up against Chavez's breach of democratic norms and interference in other countries, both violations of regional charters. But they also have a point: The Bush administration would have a lot more impact if it behaved as if the United States, rather than Venezuela, was the hemisphere's economic leader.